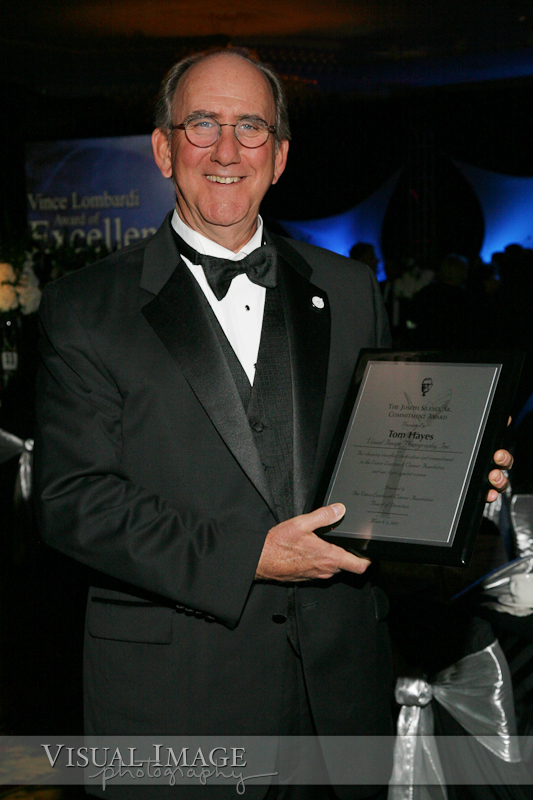 The Vince Lombardi Cancer Foundation Board of Directors presented an award to Tom Hayes, President and owner of Visual Image Photography, at the annual Lombardi Dinner Ball on March 3, 2012 at the Pfister Hotel in Milwaukee. The Joseph Sileno, Sr. Commitment Award presented to Hayes is for showing steadfast dedication and commitment to the Vince Lombardi Cancer Foundation and the fight against cancer. The award was presented to Tom Hayes, who has been donating his time, talent and services to the Lombardi Cancer Foundation for over 20 years. As one of Visual Image Photography’s major charities, Hayes photographs the Lombardi fundraising events and provides photos to the guests and to the Foundation throughout the year. Visual Image Photography, Inc. is based in Cedarburg, WI. VIP is a full service photography company specializing in athletic teams, school pictures, senior and family portraits, and weddings. VIP’s corporate headquarters and digital processing facilities are in Cedarburg, WI with portrait studios in Wauwatosa, WI and Wheeling, IL. Visit www.vipis.com to view their services and photography. You can read about the Award of Excellence dinner ball in April, where members of all four Super Bowl winning Green Bay Packer teams were present. Click here to learn more about the Vince Lombardi Cancer Foundation.